Stories are wonderful, powerful things. There was so much talk about it at last week’s Sackler symposium, there’s a new book out about it (Connection: Hollywood Storytelling Meets Critical Thinking), and I’ve written about it here before. But your presentation won’t automatically be good just because you’re telling a story. For example, here’s a story has been told several times. Ambitious man takes team to remote island, where woman is captured by huge gorilla. The team rescues the woman and captures the gorilla, taking it to civilization. The gorilla escapes into the city, causing havoc until it is shot down from a skyscraper, falling to its death. 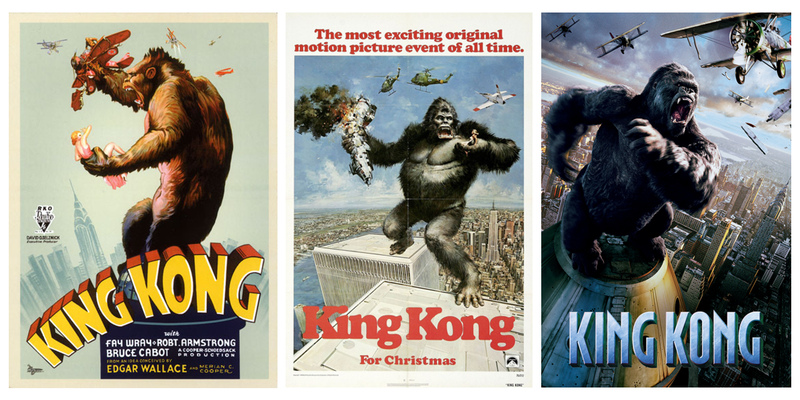 At some level, all three versions of King Kong are the same story. The 1933 version is one of the finest fantasy films ever made. It inspired generations of artists and countless imitations. Everyone knows the name, “King Kong.” Its eightieth anniversary this year was woefully under appreciated. The most recent 2005 version falls somewhere in the middle. It has brilliant high points stuck mired in an overly long telling. Movie remakes show that even when you have the same basic story structure, the success of that story in connecting with an audience can veer all over the map. You can no doubt think of bad stories you’ve endured. Some stories seemed doomed to fail at the start, because of how they are structured. Some have logical gaps and plot loopholes. Some are long-winded and complicated. Some don’t have interesting characters. Some have endings that leave you feeling cheated. Some stories, like King Kong, have greatness within them, but their story can still be killed off by a crummy execution. You can have movies that are brought down by decisions in the editing room, the actor’s performances, poor production values, or strange narrative choices. No story is foolproof (because, as the saying goes, fools are so ingenious). There’s always a way to screw them up. Yes, you absolutely should tell a story when you give a talk. But you have to go further and make sure that you’re telling a good story.